Top Ten Tuesday is a weekly meme/feature hosted by The Broke and the Bookish. This week’s topic is: Ten Books that Have Been on your Shelf Since Before You Started Blogging. I’ve only had this blog for about a month, and yet I just realized there are exactly ten books I have had since then but not yet read. Wow, that’s a pretty small number compared to what it used to be. If I hadn’t packed away half of these for the summer without realizing I would need them, I probably would only have like four books on this list. Another wow. Without further ado, here’s all the books I have had sitting on my shelves for more than a month that I have not yet read. This book has been on my TBR for so long, but other books keep coming in the way of me reading this. I’ll get to it sometime, hopefully soon. It sounds really good, and the cover is gorgeous, so I know it can’t disappoint. 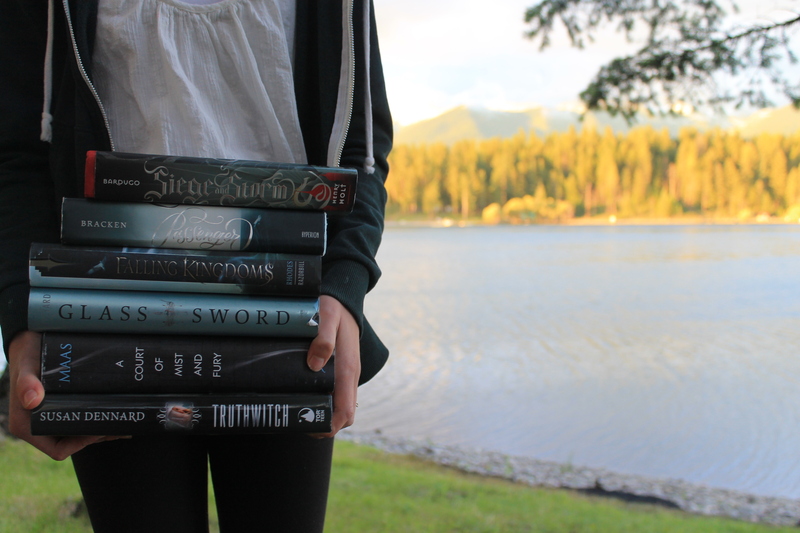 My friend raves on and on about this book and I’ve had it since it’s release date last fall, yet I still have not read The Sword of Summer. I ended up leaving it in a box for the summer, which I’m totally regretting because I want to read this book so badly. I love the other two books I’ve read so far by Morgan Matson, and I know this one can’t disappoint. I’ve heard it’s super emotional too though, so I want to wait for a time when I’m in the mood to read something like that. Carry On has been waiting on my shelf since January, but I ended up packing this one up for the summer as well. 🙁 I really enjoyed Fangirl and Eleanor & Park, so like Second Chance Summer, I know this one will not disappoint. From what I know, this is just a light summer contemporary read that totally gives me Taylor Swift vibes. I’m excited to read it, but I’m not like dying too, like Rebel of the Sands and The Sword of Summer. I’ve heard a lot of not so great stuff about this book, but it still sounds good, so I bought it anyways. I also love the cover and the title has “Glitter” in it. How could I pass that down? From what I’ve read in various reviews, I have a feeling I won’t enjoy this one that much, but I still want to to read it. Wow, I bought this over a year ago but have still not read it. I started to then lost interest within twenty pages, but I wanna give it another chance this fall, or winter, or whenever I get to it. It sounds really good, I just have to keep reading to get into it. I could not resist buying this book because the main character is a ballet dancer. However, I started it, lost interest in the first twenty pages, then didn’t pick it up again and ended up packing it up for the summer. I really want to give this one another try because it sounds so interesting. This was a secret santa present one of my classmates gave me last year, and I still haven’t read it. It’s not a book that I really had any interest in, but now that I have it, I’m gonna read it eventually. Plus, my friend said it was really good so I’ll read it someday. Okay, I don’t have any desire to actually read this, but I have to within the next week for school. It was the tenth and final book on my shelf though, so I had to include it. What are some books you’ve had sitting on your shelves for a long time? Make sure to link your Top Ten Tuesday post below as well! Carry On and The Glittering Court, boy do I feel those. I remember I HAD to have The Glittering Court because it was Richelle Mead but now I’m hesitant due to the mixed reviews. I’ve heard nothing but great things about Second Chance Summer! I haven’t read any other Richelle Mead books, but the title and cover were just too perfect for me to not pick up The Glittering Court. I haven’t heard anything but great reviews about Second Chance Summer either, which just makes me 10000% more excited to read it. I’m about a quarter of the way through Rebel of the Sands right now (I started it the day after I posted this, ha!) and it’s already really good. I hope you have a chance to get to it and The Darkest Part of the Forest soon, and I’d love to know what you thought of them. I’m hoping to read at least most of these before the year ends, good luck! I can definitely see how it will be helpful during the upcoming school year, I’m just dreading reading it. Thanks though, I think I’m just going to read it when I drive home this weekend. Second Chance Summer is on my list, too! And I highly recommend Rebel of the Sands – I can’t wait for the sequel! Thanks, I’m just about to start it as I write this. XD I’m super excited! I hope you have a chance to get to Second Chance Summer soon! Have you read any of Matson’s other books? I have Rebel of the Sands on my pile too. 🙂 I need to read The Darkest Part of the Forest at some point too. The Sword of Summer is REALLY GOOD. Great Top Ten! 😀 After reading the Bloodlines Series, and not liking it, I don’t think I can handle another book series by Richelle Mead…Especially since I’ve heard a lot of mixed reviews about Glittering Court. I won’t make the same mistake twice! But whatever, everyone has different taste, so I hope you will get to read this book and maybe it will be the book for you! 😀 My Top Ten Tuesday!